Okinawa Zoo Park is being transformed into a winter wonderland, complete with a laser light show. 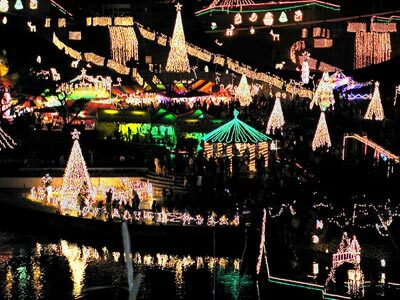 Shimmering snow and vibrant colors abound beginning this weekend at the Okinawa City Zoo, as Christmas Fantasy opens its holiday season run. The gates are open 4~10pm Saturday and Sunday, with last entry at 9:30pm. The Christmas Fantasy will also run December 22~27th. Snow, on Okinawa? 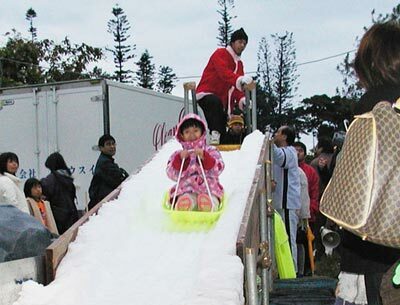 Organizers have more than four tons of snow to make a kamakura, the snow cottage found in traditional snow country. The hands-on exhibits give spectators a chance to play with the snow. Snow slides are part of the setting, and of course, opportunities to build a snowman. A snow show will take place four times each day, and kids―and big kids, too ―can make snowballs. The laser light show is Okinawa’s biggest, and runs three times each evening. 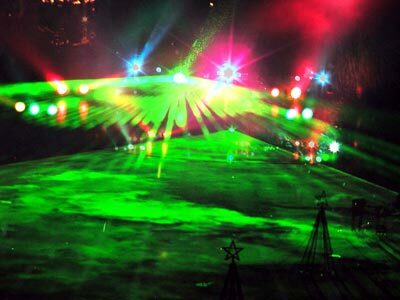 Laser created special effects and fireworks, which include fire, snow and other variations, have been redesigned and tweaked for this year’s show. Entertainment abounds at this year’s Christmas Fantasy. Headlining the program is a Christmas Concert featuring MaMi and her band, Noche Canela. The 25-year-old singer belts out Okinawa music with a contemporary twist. Salsa sounds come from two groups, Latin Soul and Mambo Pistachio, together with the energetic Sarsaparilla Dance Team.Also on the music card are the Teeda Family, street performers and dancers filled with energy channeled into their break dance routines. Family member performaners run five years of age to the late 20’s, and the music’s as varied as their ages. JoJo the Clown, from the U.S., will do the juggling, perform tricks and demonstrate his comic streak during his daily rituals. Amusement areas have been established for youngsters, and a big bingo game will provide extra fun for adults. Prizes include stuffed animals, toys, bicycles, game software and a bunch more. Admission for adults and high school students is \1,700 in advance, \2,000 at the gate. Children four to junior high school age get in for \1,000 advance tickets, or \1,200 at the gate. Admission is free for those three and under. Tickets are on sale at all Family Mart, Hot Spar, Book Box, Denen bookstores, A-Coop, Max Valu, Jusco and Lawson stores, Okinawa Zoo Park, Ryubo Palette Department Store, Hamby Free Zone, Ryubo Shuri Department Store, Mitsukoshi Department Store, Tsutaya Ginowan Branch and Nakagusuku Mall. Parking is available at the Okinawa Zoo Park, as well as at Okinawa City Office and Awase Seaport. A shuttle bus will operate between the outer parking lots and the Okinawa Zoo Park. Those riding the bus on Naha-Kodomo-no-Kuni Ryukyu Bus Line 22 are entitled to a 35% discount on runs to and from Okinawa Zoo bus stop, and children below school age, traveling with a parent or guardian, ride free.